Cheapest an IP camera with IR, pan and tilt I've seen. It's a clone of the popular Foscam, can be wall mounted. View it from anywhere in the world over the internet from any device that has a browser. Which is also the reason to password protect it! One I bought a few years ago came in very handy to find out who was ripping my fence down, turned out to be the 9yr old asbo wannabe a few doors away. 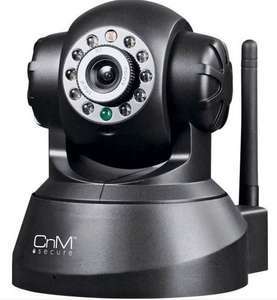 Top of the range, cutting edge technology makes this one of the best home security cameras around. Featuring motion detection that initiates recording, email alerts for when it senses movement and FTP upload, this camera gives you the control. MSN server and free factory DDNS. Supporting wireless network: Wi-Fi/802.11bg . Image frame rate: max 30fps. Image sensor: 300,000 pixcels CMOS. Night vision: 11 LED lights. Motion detection, email alert and FTP upload. CMOS CCTV camera with CMOS CCTV camera with 10 LEDs. Argos clearance on EBay. Great product. Am looking at putting one into our garden. Lots of sheds being broken into round here. does the premises where the camera is need internet ? or just to watch it? you need WiFi where the camera is installed and internet of any type to view what is going on. note that is it possible for intruders to turn up with Wifi Jammers that easily render Wifi connected cameras useless. i'm assuming, as it says it's wired, it's powered through a 13amp socket, rather than an internal rechargeable battery? the description says something about having a 1m cable? i'm assuming, as it says it's wired, it's powered through a 13amp socket, … i'm assuming, as it says it's wired, it's powered through a 13amp socket, rather than an internal rechargeable battery? the description says something about having a 1m cable? Is it exclusively wireless or does it have a LAN socket as well? Never mind, I visited the link and saw the images showing it does indeed have the LAN socket. Where would it record to? The website pictures show what looks like an ethernet socket. hi, you can view from ANY device that has a browser, you just need to know what your home IP address is and type that into the address bar of the browser. The software mentioned allows you to configure the camera's settings and also view it without knowing it's IP address, but for devices without the software like your phone you can still see the camera by going to it's IP address. note that is it possible for intruders to turn up with Wifi Jammers that … note that is it possible for intruders to turn up with Wifi Jammers that easily render Wifi connected cameras useless. If they are that good, you have far bigger problems that a little IP cam will prevent. As it is, the average scally will neither know nor care if there's a camera present. At best you'll be able to watch your premises being robbed. At worst, they'll nick the camera, too. If they are that good, you have far bigger problems that a little IP cam … If they are that good, you have far bigger problems that a little IP cam will prevent.As it is, the average scally will neither know nor care if there's a camera present. At best you'll be able to watch your premises being robbed. At worst, they'll nick the camera, too. Argos clearance on EBay. Great product. Am looking at putting one into … Argos clearance on EBay. Great product. Am looking at putting one into our garden. Lots of sheds being broken into round here. It's an indoor camera and not weatherproof. Assume inside the shed could be ok for them, assuming it has power, in range of their wifi and is waterproof(?) Or if they can film from a window of their house that meets those requirements. depending on your router this being only BG may slow all your high speed modern N devices down. Thanks for posting leeds85. Decided to give it a go as had some eBay credit and had looked at one of these in the past. Cheapest an IP camera with IR, pan and tilt I've seen. I should hope they weren't - just bought a foscam ip camera with 720p for cheaper than that! The camera I had before it, which looked a lot like this (like all the clones do), had much poorer picture quality and cost about £30. I should hope they weren't - just bought a foscam ip camera with 720p for … I should hope they weren't - just bought a foscam ip camera with 720p for cheaper than that! The camera I had before it, which looked a lot like this (like all the clones do), had much poorer picture quality and cost about £30. They were £79.99 on the Argos site at one point as flang mentions. Archive.org captures a page from February 2013 - https://web.archive.org/web/20130220032315/argos.co.uk/m/s…htm (you'll need to copy the link rather than click it due to HUKD's redirect). yeah according to this here. I already have a couple of foscams and 720 webcams connected to my HP microserver running blue iris software and to be fair it really depends what the cameras are looking at as to how good the quality is. ie, 720 quality on my doorstep cam is overkill as vga quality is ample enough to obtain a clear face image due to the small field of view. Wow, can't believe people would have paid £80 for this! Yeah i did try and post a link but its gone for moderation which is strange considering ive been a member for 7 years! < ha its been approved now!! Assume inside the shed could be ok for them, assuming it has power, in … Assume inside the shed could be ok for them, assuming it has power, in range of their wifi and is waterproof(?) Or if they can film from a window of their house that meets those requirements. Shipping is over 16 quid. Sorry bud, not having a go at you but we have to put the record straight for any 5 year old reading these threads. wireless = wire ...less = no wires. Strictly speaking (and perhaps even common sense), it does mean that a device which needs to be connected to the mains with a cable wire cannot be called wireless. (It can contain internal wires through electric circuitry, hidden). If you want an electrical/electronic device to be wireless, it has to be powered internally or through external sources such as solar, wind etc. So there's really no need to lol at people who think 'wireless' refers to devices with no cables dangling out of it. Sorry bud, not having a go at you but we have to put the record straight … Sorry bud, not having a go at you but we have to put the record straight for any 5 year old reading these threads.wireless = wire ...less = no wires. Strictly speaking (and perhaps even common sense), it does mean that a device which needs to be connected to the mains with a cable wire cannot be called wireless. (It can contain internal wires through electric circuitry, hidden). If you want an electrical/electronic device to be wireless, it has to be powered internally or through external sources such as solar, wind etc. So there's really no need to lol at people who think 'wireless' refers to devices with no cables dangling out of it. I can't help but jump in, just to be mischievous if nothing else:). You can't have it both ways. How come you get away with internal wires through electric circuitry, hidden,with your definition? Wireless= wire ...less = no wires. Strictly speaking (and perhaps even common sense), this includes no internal wires through electric circuitry, hidden also. Come on....everyone knows what wireless means on an IP device. Don't they? Comes to £31.63 with their standard shipping to the UK. you need WiFi where the camera is installed and internet of any type to … you need WiFi where the camera is installed and internet of any type to view what is going on.note that is it possible for intruders to turn up with Wifi Jammers that easily render Wifi connected cameras useless. Show me one on Amazon and I'll believe you. Pay a little extra and get the original Foscam, every now and then they are on promotion. I paid £39 for mine and worth every penny.